- A Medical Food for the Dietary Management of Irritable Bowel Syndrome. - Exceptionally beneficial for IBS abdominal pain and spasms, diarrhea, and urgency. - Peppermint has anti-spasmodic and pain-killing properties that make it very helpful for soothing and relaxing the digestive tract. - Naturally caffeine free, gluten free, FODMAPS free ~ Certified organic by QAI ~ Kosher certified. - 36 jumbo unbleached teabags! 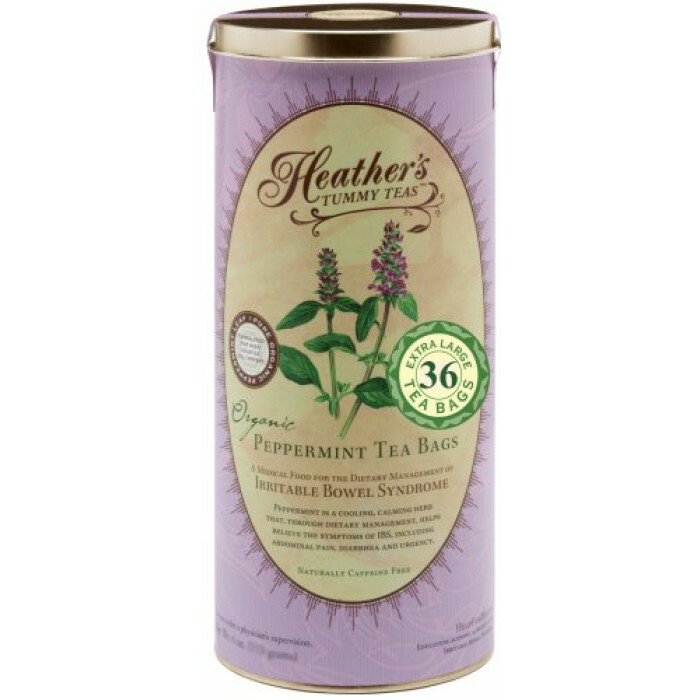 Heather's tummy tea organic peppermint for IBIS is a medical food for the dietary management of irritable bowel syndrome symptoms. Peppermint is a cooling, calming herb that, through dietary management, helps relieve the symptoms of IBIS. Clinical studies have shown that peppermint is exceptionally beneficial for IBIS abdominal pain and spasms, diarrhea, and urgency. Packed in very generous quantities meant to be used daily as a medical food for IBIS. Brew a delicious cup tea several times a day, every day, as part of your dietary management of IBIS symptoms. This tea is uniquely formulated to contain a very large leaf size and the highest possible volatile oil content (both factors are integral to the quality and potency of peppermint). Our peppermint is carefully selected from the most recent possible harvest date, processed for minimal volatile oil dissipation, and packed to stay as fresh as possible. It’s the volatile oils in peppermint that make it so effective for the dietary management of IBIS symptoms. Our peppermint is guaranteed to be the freshest, strongest, most delicious peppermint tea available. 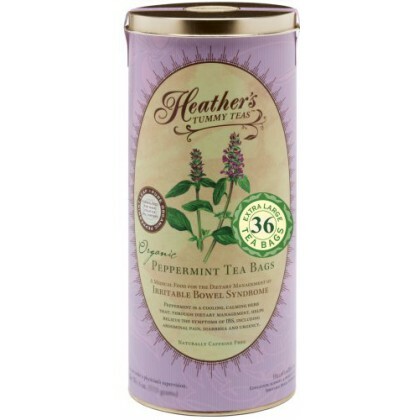 If you're used to drinking peppermint tea from store-bought tea bags, the difference in strength and taste of heather's tummy tea is astonishing. The high potency and quality of heather's tummy tea is tremendously helpful for your gut, with a very noticeable soothing effect on your gig tract. Peppermint is classified as grass (generally recognized as safe) by the fad. Brew just as you would brew loose tea, with any type of large tea strainer. The stronger you brew the tea the more effective it will be. This is a medical food for the dietary management of IBIS symptoms and intended to be used under a physician's supervision. Certified organic and kosher. Contains no, gluten, sugar, salt, corn, soy, yeast, milk or preservatives.